FBI Is Very Excited About New Machine That Scans Your DNA In 90 Minutes! A team led by the Lawrence Livermore scientists has created a new way to selectively deliver drugs to a specific area in the body using carbon nanotubes (CNTs). The DNA-based carbon nanotubes, dubbed “porins,” tunnel through cell membranes. They simulate ion channels, which are used by cells to transport vital chemicals: the short CNTs form tiny pores that transport water, protons, small ions, and DNA. The team included colleagues at the Molecular Foundry at the Lawrence Berkeley National Laboratory, University of California Merced and Berkeley campuses, and University of Basque Country in Spain. * The research showed that CNT porins display many characteristic behaviors of natural ion channels: they spontaneously insert into the membranes, switch between metastable conductance states, and display characteristic macromolecule-induced blockades. The team also found that, as in the biological channels, local channel and membrane charges could control the ionic conductance and ion selectivity of the CNT porins. There is much interest in developing synthetic analogues of biological membrane channels1 with high efficiency and exquisite selectivity for transporting ions and molecules. Bottom-up2 and top-down3 methods can produce nanopores of a size comparable to that of endogenous protein channels, but replicating their affinity and transport properties remains challenging. In principle, carbon nanotubes (CNTs) should be an ideal membrane channel platform: they exhibit excellent transport properties4, 5, 6, 7, 8 and their narrow hydrophobic inner pores mimic structural motifs typical of biological channels1. Moreover, simulations predict that CNTs with a length comparable to the thickness of a lipid bilayer membrane can self-insert into the membrane9, 10. Functionalized CNTs have indeed been found to penetrate lipid membranes and cell walls11, 12, and short tubes have been forced into membranes to create sensors13, yet membrane transport applications of short CNTs remain underexplored. Here we show that short CNTs spontaneously insert into lipid bilayers and live cell membranes to form channels that exhibit a unitary conductance of 70–100 picosiemens under physiological conditions. Despite their structural simplicity, these ‘CNT porins’ transport water, protons, small ions and DNA, stochastically switch between metastable conductance substates, and display characteristic macromolecule-induced ionic current blockades. We also show that local channel and membrane charges can control the conductance and ion selectivity of the CNT porins, thereby establishing these nanopores as a promising biomimetic platform for developing cell interfaces, studying transport in biological channels, and creating stochastic sensors. 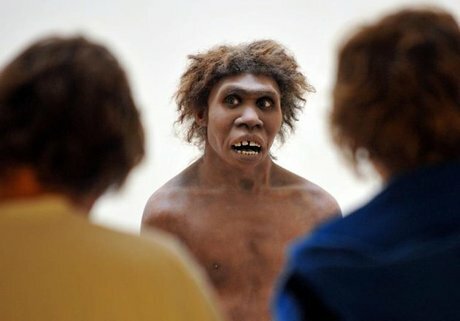 Scientists claim to have unraveled the oldest DNA ever retrieved from a Homo sapiens bone, a feat that sheds light on modern humans’ colonization of the planet. Teased out of collagen in the ancient bone, the genome contains traces from Neanderthals — a cousin species who lived in Eurasia alongside H. sapiens before mysteriously disappearing. The discovery has a bearing on the so-called “Out of Africa” scenario: the theory that H. sapiens evolved in East Africa around 200,000 years ago and then ventured out of the continent. Dating when Neanderthals and H. sapiens interbred would also indicate when H. sapiens embarked on a key phase of this trek — the push out of Eurasia and into South and later Southeast Asia. The bone found at the Irtyush River, near the settlement of Ust’-Ishim, carries slightly more Neanderthal DNA than non-Africans today, the team found. These differences provide a clue for a “molecular calendar”, or dating DNA according to mutations over thousands of years. Using this method, Paabo’s team estimate interbreeding between Neanderthals and H. sapiens occurred 7,000 to 13,000 years before the Siberian individual lived — thus no more than 60,000 years ago. This provides a rough date for estimating when H. sapiens headed into South Asia, Chris Stringer, a professor at Britain’s Natural History Museum, said in a comment on the study. If today’s Australasians have Neanderthal DNA, it is because their forebears crossed through Neanderthal territory and mingled with the locals. “The ancestors of Australasians, with their similar input of Neanderthal DNA to Eurasians, must have been part of a late, rather than early, dispersal through Neanderthal territory,” Stringer said in a press release. Anthropologists suggest a northern branch of Eurasians crossed to modern-day Alaska more than 15,000 years ago via an “ice bridge” that connected islands in the Bering Strait, thus enabling H. sapiens to colonise the Americas.